Looty Fruity Classic Slot Review - Casino Answers! Looty Fruity is a 3-reel, 1-line classic slot machine developed by Random Logic, featuring wild multipliers. You can play the Looty Fruity classic slot machine at Bovada. The Looty Fruity casino game is a nickel slot. Bets on the Looty Fruity slot machine are $0.05, $0.25, $0.50, $1 and $2. You can select 1-3 coins per spin. The highest total bet possible on the Looty Fruity online slot machine is $6 per spin, which is a low maximum bet. The betting range is best suited for casual slots players rather than high rollers. 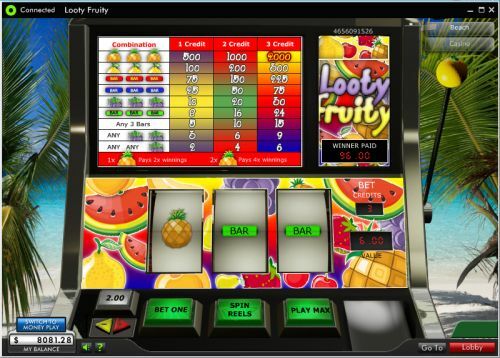 To play the Looty Fruity fruit machine, use the “Bet One” button to select your bet and press “Spin Reels” or simply hit “Play Max” to play the 3-coin maximum bet. You may also click on the lever as an alternative to the “Spin Reels” button. The Pineapple is the top-paying symbol on the Looty Fruity online slot game. If you hit 3 Pineapple symbols off a 3-coin maximum bet spin, you will win the 2000 coin top jackpot. The Pineapple symbol is a wild multiplier, meaning when it substitutes in winning combinations, it will double your winnings or two can quadruple your winnings. You can win big from hitting a winning combination with this symbol in it, you can win bigger by hitting two symbols or you can get the biggest win by landing all three Pineapple symbols at Bovada! There are 9 winning combinations on the Looty Fruity classic slot machine. The complete payout schedule is as follows (1/2/3 coin payouts in parenthesis): 1 Berry symbol (2/4/6), 2 Berry symbols (3/6/9), any 3 Bar symbols (5/10/15), 3 Green Bar symbols (8/16/24), 3 Berry symbols (10/20/30), 3 Blue Bar symbols (25/50/75), 3 Red Bar symbols (75/150/225), 3 Lemon symbols (100/200/300) and 3 Pineapple symbols (500/1000/2000). Looty Fruity is a very solid classic slot game from Random Logic. It looks bright with an animated logo and lots of colourful fruit. The payouts are good, although they don’t scream out at you as amazing payouts (which can be fixed thanks to the wild multiplier!). You can play the Looty Fruity online slot game when you sign up and make a deposit today at Bovada! Can American players play the Looty Fruity reel slot machine online for real money? No, USA players are unable to play the Looty Fruity online slot for real money at Random Logic casinos. Instead, we suggest playing at a USA-friendly online casino like Slotland Casino. Can I play an instant play version of the Looty Fruity fruit machine slot for free? Yes, a Looty Fruity flash game is available to play for free or real money. Simply head over to 888 Casino and choose the “Instant Play” option. This is a great way for Mac slots players to play the Looty Fruity online casino game. For best performance, we’d like to remind you to download the latest edition of Adobe Flash Player.